Beautiful, free-standing villa. 380 m2 with a private (heated) swimming pool, gorgeous view, and complete privacy. 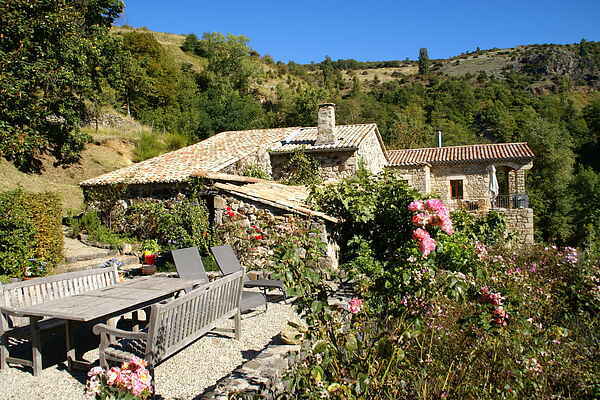 This splendid stone villa is representative of the Ardèche architectural style. It consists of an older part with low corridors dating from 1873 and was recently expanded with a new part built in the same style. You'll have use of several terraces, each equipped with garden furniture and a lush multilevel garden. Lower down the property lies a beautiful private swimming pool with an outdoor shower and lounge chairs, surrounded by a gravel terrace. The new part is especially comfortable and meets all modern needs and expectations. The older part is atmospheric, authentic and full of charm. The villa lies in the peace and quiet of the mountains at a height of 750 m, only 11 km from the city of Privas, and makes a great starting point for unforgettable exploratory adventures. Ardèche is strikingly beautiful. To the north of Privas lies a lush, thickly forested mountain landscape. In the immediate vicinity of Pourchères there are winding mountain paths everywhere, each one more beautiful than the next.